Three people, two of them are close friends each in their own way with the third. And those same two are merely polite acquaintances. They are together in a cabin in the woods on a late autumn weekend to make the big plans of youth. The vitriol, the lawsuits, the lost time, the lost fortunes and the lost friendship between them would arrive in the years to come. But for now, things were cool. Cool, that overused word invented to describe an indefinable and intangible quality that you know instantaneously the moment you see it, hear it or touch it. While dinner is being prepared on this cold windy grey Midwest afternoon I put the Blue Nile’s first album on the stereo. Immediately things begin to warm up. Suddenly it’s the first heat wave of summer. Why is it rolling down on the young and foolish? Are we rich or are we poor? The heat wave of love rolls down on us all at one point or another and yes it makes us both young and foolish. A deadly combination in any man’s country. You begin to take chances, you roll the dice and bet the ranch. But there is magic in these sounds … open yourself up and they will carry you away in a heartbeat. The album begins to play, the way wind chimes are barely audible in a slight breeze. Very softly and slowly, it seeps into your consciousness like waking from a pleasant dream on a warm night. The cold wind outside the cabin stops blowing. You can almost feel the heat, the urban horns and then the sparse but booming bass line signals the coming discord. You get caught up in the heat of the moment. It will be some time before you realize you have made the wrong move but for now you are powerless to stop it. How can something radiating this much heat be so cool? You are confused by the paradox, but it’s the thought of being up on the rooftop looking down on everything else that makes this so cool. Ben E. King and the Drifters showed us how to escape the city with all its noise and pollution by going up on the roof. But you are not satisfied with mere escape—you want to own it all and the Blue Nile shows you how. 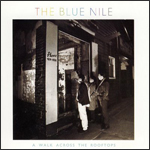 By virtue of their ultra cool, you just don’t go up to the roof, with the Blue Nile you float across the rooftops. Because when you’re in love, you are on top of the world. You are floating, you are above it all, you have become cool, and most importantly you are in love. The pace quickens and the city slowly warms while passion rains down and you are held in the great magic trance of love. Will we always be happy go lucky? Eventually every heat wave breaks and the inrushing cool air refreshes everything in its wake. Thankfully the Blue Nile is holding up well over time. Even now when a song from this album pops up on my iPod I usually end up listening to the entire album. By being inherently cool it seems capable of refreshing itself as the years go by unlike so many relationships that wither under adversity and recoil from the weight of time. Time to take another chance. Time to start anew again.